Very early on a Thursday morning a special visitor arrived. 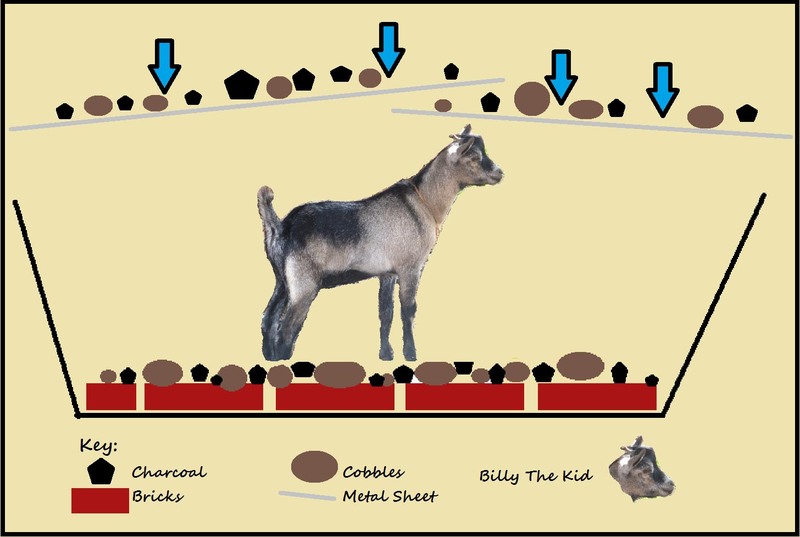 His name was Billy the Kid, but he was no human nor outlaw, but a goat. The context of this is that every year MEMSAP has a pit roast in the form of a pig. This year, however, the field crew is much smaller, so to keep the tradition going we needed to tweak it a bit by using a smaller beastie and a different cooking method. Unlike previous years, we have the expert advice and guidance of our chef Samson, who is the skill behind this endeavour. The concept, some labouring, and most of the unabated excitement comes from the rest of the crew. This year the feast is supplemented (and mostly justified) by the addition of an archaeological experiment! Sheila wants to investigate several factors relating to burned quartzite cobbles and flakes found at sites Chaminade II, Chaminade I and several Test Pits. The aim of the experiment is to try to understand whether artefacts found in the assemblages could have been burnt purposefully prior to knapping, or whether the burning is due to a natural event, such as from a bush fire, that occurred after the use by humans. In addition, we compare the burnt cobbles, found on excavations, to those we experiment on to see whether they are similar, or not, and to examine whether they might have been used around the edge of the fire for the use of a hearth. These are very complicated questions with many variables, so our little field experiment is only meant as a thought-provoking preliminary investigation, with results that will be very general. Dealing with Billy the Kid is a several stage process and in no means a short undertaking. The first stage is to make an oven big enough and hot enough for the job. This means digging and preparing an underground pit and under instruction from Samson, creating the oven itself inside. Luckily the ground we dug in was sand which was loose enough to dig easily and had enough structure that it held its form. We angled the walls inwards to prevent any slippage, placed bricks and cobbles in the base to trap heat and prepared metal sheets with rod supports to act as a roof where a second fire would be lit. After Billy the Kid has met his humane demise, he was prepared for the oven. To make him succulent and tasty we added stuffing, herbs, spices and a wonderful glaze. The innards were carefully removed and cooked separately, and the stuffing consisted of potatoes, rice, tomatoes, garlic, onion and spices. To keep the stuffing from spilling out it was sewn together with a soft wire. Then the meat was scored before rubbing a glaze of oil and spices into the meat. 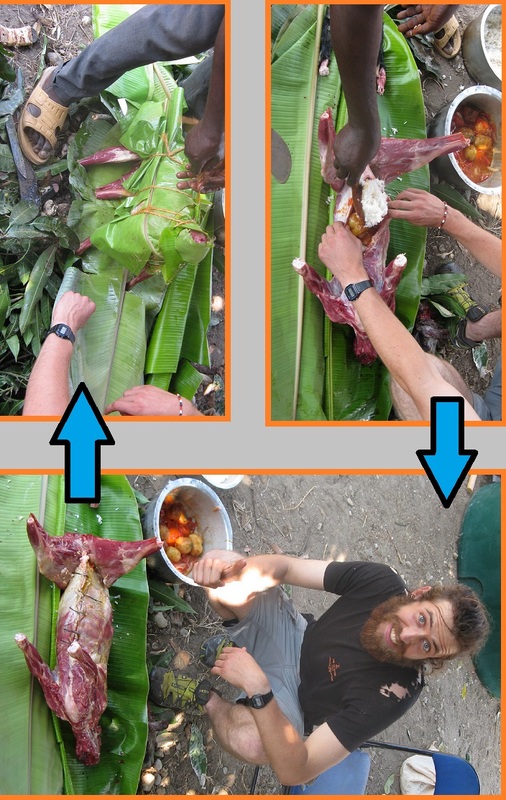 The final step involved wrapping a banana leaf around the goat to keep the meat moist and to prevent it from being in direct contact with the hot coals. A very delicate and important stage is placing Billy the Kid into his oven. The oven has a coal and wood based fire in 2 places, below and on top. This is to give an even and consistent heat to the cooking. The fire below burnt for one hour to produce a significant heat which is maintained and trapped evenly in the bricks and cobbles placed within. After this, Billy is inserted into the centre of the oven and the top fire is lit after which Billy cooked for about three hours. We put a ring of cobbles around the fire to create a hearth. As with most experimental archaeology, you really need plenty of data to get a comprehensive understanding of the subject. For this first experiment we used about fifteen cobbles, so of course the results are preliminary and quite general. We put cobbles around the fire as seen in prehistoric hearths. We had to wait a whole night to retrieve the cobbles from the pit, as they stored heat very well indeed. We saw that cobbles around the hearth were blackened on the outside, but had little or no visible change to the interior matrix of the stone. The cobbles inside the oven and fire, however, were fully blackened on the exterior and often cracked open from the heat. A few of the cobbles have been broken open in the days since the experiment. One of the most obvious effects of burning is how easily these stones now break, showing that while there may be little visual evidence of heat-treatment, the fracturing qualities of stone are affected by prolonged exposure to heat. Additionally, we saw that when a stone that is already broken is put into the fire, its entire surface—and not simply the original cobbles surface—is blackened. 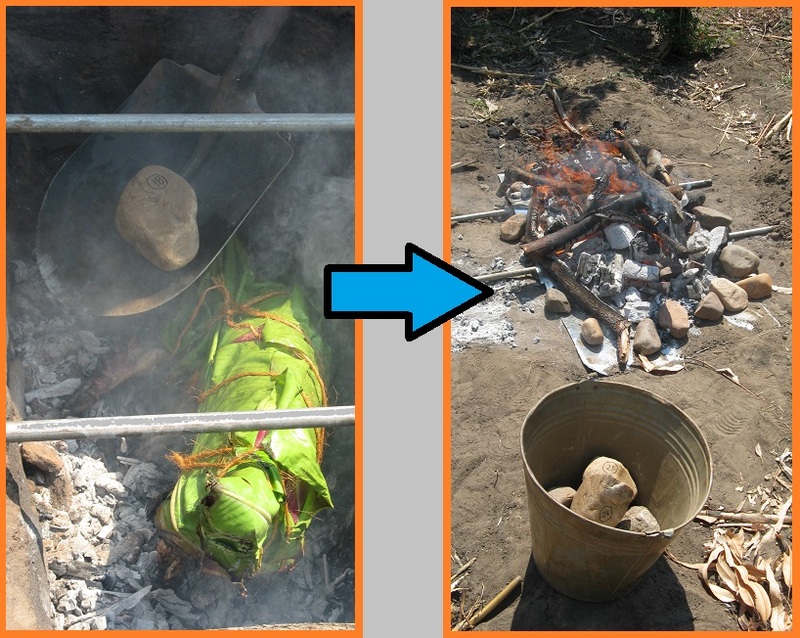 This confirms that there are several artefacts in the assemblages here in Karonga that were flaked after being exposed to fire. This finding is very interesting, as burned quartzite tends to be very grainy and brittle, and so doesn’t seem like an ideal kind of stone to make tools from. However, it is known that quartz, flint, and silcrete are all types of stones that humans have burned to improve their flaking quality, so perhaps there are some aspects of “quality” that we are overlooking here with our quartzite. While this sample set is still quite small, it suggests that there are clear indicators of exposure to fire than can be recognized in an archaeological assemblage. It is unclear, however, under what conditions such heating would have taken place—perhaps these stones were used to build a hearth, or maybe they were intentionally burned and then flaked because of some preference for the ways these stones break after heat-treatment. 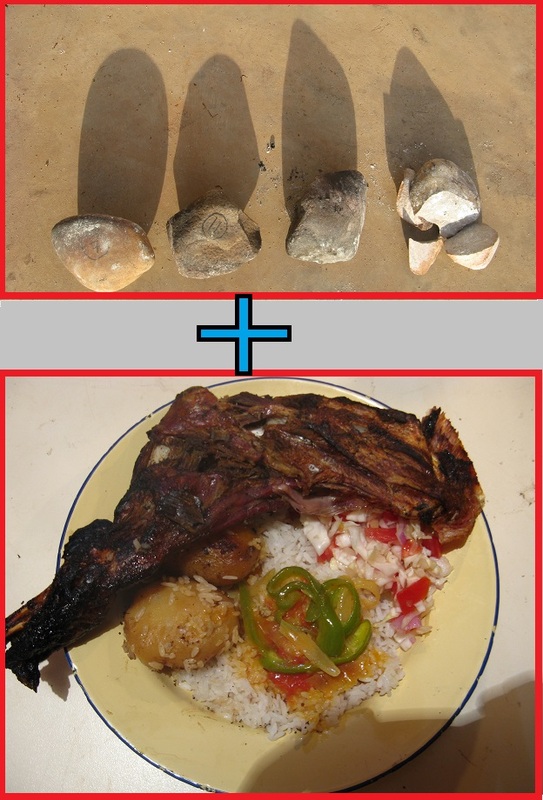 We are never disappointed with our meals in Malawi, but our goaty feast was really exceptional. The meat was complimented with sides of rice, a tomato based capsicum sauce, a light cabbage salad and of course all the stuffing which had been cooking inside Billy for a few hours. Whilst it was no small undertaking, the process of the feast is always rewarding, especially when you can add some archaeology into the mix! For most people this is not something they can easily do at home, but if you ever have the chance to take part we highly recommend it.